Bernie Sanders has no problem sending billions of Black taxpayer dollars to Israel but does not support reparations for Black people. What Nolan missed in rushing to judgment about the nuanced lyric, is the oft-omitted exclusion of the opinions of African Americans, specifically African American Descendants of Slaves (AADOS), from the larger American narrative of the selective amnesia when it comes to upward mobility in racist America. Nolan claims that the lyrics are a repetition of an ancient charge against Jews “that they control the world’s money supply.” Lebron James, and 21 Savage stress, including many prominent African Americans who rose to defend them in public that it is not, and that 21 Savage and Lebron merely attempted to paint the picture of obvious Jewish group advancement in America vis-à-vis the exclusion of African Americans in the United States from accessing the same opportunities that Jews are able to access as a result of their race. Key is the issue of reparations for AADOS. More specifically, what continues to shock most Black people in America is the continual insistence of American politicians and leaders to unswervingly support reparations for Jews, and to also continue to support aide to the Jewish nation of Israel, while avoiding the same theory that African Americans also deserve reparations in like manner as Jews have been granted reparations. “Omar issued a statement thereafter, in which she “unequivocally apologized” for unintentionally invoking “anti-Semitic tropes,” but made crystal clear that “the problematic role of lobbyists in our politics” – whether it be AIPAC, as well as the NRA or the fossil fuel industry – was one she would continue to aggressively address and combat.” (The Intercept). Juxtapose the actions of the Democratic leadership with their actions against GOP Congressman, Steve King, who has served in the U.S. House of Representatives for sixteen years, yet Democrats – who controlled the House for four of those years and now control it again – never formally rebuked or condemned him until last month (they did so at the same time that Republicans removed him from his Committee assignments due to a long history of white supremacist remarks). It is in the face of this hypocrisy in the racist culture and politics of the United States government that the import and nuance of 21 Savage’s lyrics can be scrutinized. It is true that African Americans have agonized just as much—if not significantly more under slavery and Jim Crow—as Jews have suffered during the Holocaust. Meanwhile, what is apparent in American politics and culture is simply that Jews are upheld in one esteem in America and African Americans are suppressed in a totally different caste. There’s one set of rules for Jews (and anti-Semitism) in America and there’s another irrelevant, non-existent set of rules for African Americans (and anti-Blackness) in America. Kamala Harris herself has claimed that she has descended from African slaves in Jamaica, although Kamala’s mother is fully Indian, and her father boasts broadly about his Irish ancestry. Kamala herself was raised as a Hindu outside the United States. 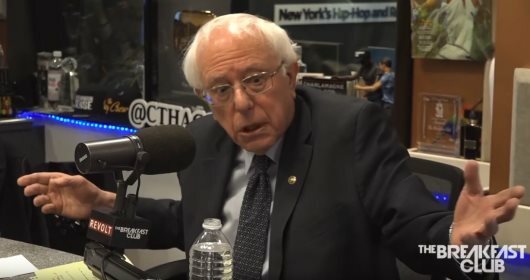 The next face of anti-Blackness that continues to baffle most supporters of the Democratic Party is Bernie Sanders: A Jewish man who admits a political identity of democratic socialism. When Sanders too was questioned on the Reparations issue for AADOS, he missed an important moment. He also refused to endorse the need for the nation to pay reparations to African Americans in the same way and manner that the Nazis have paid, and continue to pay reparations to descendants of Jews from Germany, and to the nation of Israel. When Jews, like Bernie Sanders, who openly endorse reparations for their white ethnicity, refuse reparations to Black ethnicities like AADOS, it begs numerous questions about white identity politics in general. More troubling it begs questions about the honesty and true character of the Jewish reparations project if it cannot be squared with the need for the United States—whose primary wealth was based on the enslavement of Africans—to similarly embark on a project to atone for their past atrocities against humanity. If the Nazis can do it, why can’t the Federal Government of the United States of America? It is perhaps on the back of this troubling contradiction within the Jewish communities of the Democratic Party that calls to boycott the Israeli influence in America (Israel is a self-proclaimed Jewish nation built out of Nazi reparations for Jews), which owns a heavy pervasive lobby in the United States (AIPAC), have to be considered. Not only is Israel committing crimes against Palestinians in the same nation, Israel is also committing human rights abuses against African communities in Israel. It seems none of this matters to the United States government which continues to tout allegiance to Israel and similarly expects all of its citizens and politicians to do so in order to avoid rebuke, or more perniciously, in order to avoid being labeled as anti-Semitic. Why is reparation for Jews more important than reparations for AADOS, so much so that reparations to Israel cannot even be questioned in the United States? Is it perhaps because Jews are in themselves whites or Caucasians? It is perhaps because as a result of this Jewish whiteness, a Black ethnicity’s equal humanity cannot be granted in the same way and manner that the humanity of Jews have been so granted in the broadest sense of reparations? If Kamala Harris can say that “We can both support Israel and our country,” why can’t she also admit that we can both support Reparations for AADOS and also support our country? The reason Kamala must support Israel and motivate her supporters to do likewise, is the same reason she does not support reparations for African American Descendants of Slaves. And the simple reason is that Jewish matters in the United States matter, while issues of African American concern do not matter. In fact, Jews have always thought about upward mobility in American sociodemographic politics, of civil rights, and particularly of the reparations question in zero-sum terms. If AADOS must receive reparations, it limits the amount of reparations that Jews and the Jewish nation of Israel can get from the government of the United States. For instance in Hollywood, Nancy MacLean details that a budding neoconservative Jewish American ethnic group, during the civil rights movement, started framing the issue of integration in America in zero-sum terms: more African American representation meant less Jewish American representation. Along with higher education recruitment and academe, the good jobs in the film industry into which African Americans sought entry were occupations in which Jewish Americans had long enjoyed a strong presence. As African Americans and their federal allies’ calls for proportional representation in employment gained steam, Jewish Americans essentially refused to integrate those institutions or sectors in which Jews were over-represented. What Nancy MacLeans writes about in that period of dramatic flux in race relations shows that Jewish Americans, once they had made significant gains into segregated American institutions, rather consciously began to cleave increasingly towards their racial allegiances (white) and became equally receptive to racial resentments that were being propounded in incipient neoconservative discourses of the day against African Americans. The same is true now when questions are raised about the reparations issue for AADOS. The same is true when the wide socioeconomic gap between Jewish Americans and African Americans is questioned even in lyric by 21 Savage. The new face of anti-Blackness in the latter half of the twentieth century and in the twenty-first century is undeniably as Jewish as it has been white.